Words cannot describe the ambiance and beauty of our home. Nestled in soaring fir and red wood trees with a breathtaking view of Puget Sound, Olympic Mountains and Whidbey Island. It is built of Wilkinson stone from Mt. Rainier. You can watch the cruise ships leave Puget Sound while a the squirrel jumps from tree to tree and an eagle may be flying overhead. It is very secluded and quiet location. Take a relaxing dip in the hot tub surrounded by total privacy overlooking the views and sunset. The home was recently updated with hardwood floors, granite kitchen (all Dacor appliances - gas stove, warming drawer, convection oven) and is fully equipped. There is a huge wood burning fireplace in the living room tastefully decorated northwest contemporary and which also has a fantastic view of Puget Sound and a huge red wood tree which makes you feel like you are living in the trees. There is a huge deck facing the Puget Sound, Whidbey, Sunset, and Olympic Mountain Views with plenty of space for entertaining, table and chairs, BBQ, and hot tub for 6 people. There is a remote control gas fireplace in main level bedroom and it has a huge 5 x 5 shower with double controls and private courtyard. Each bedroom has it's own bathroom. The upper master bedroom, has a jetted jacuzzi tub overlooking the view, king bed and small private balcony and a huge California Closet. The 2nd bedroom on upper level has king bed and full bathroom. The bedroom on main floor has queen bed, two person shower with heated floor, antique oak double vanity, gas fireplace and private lanai. There is also a full utility room. 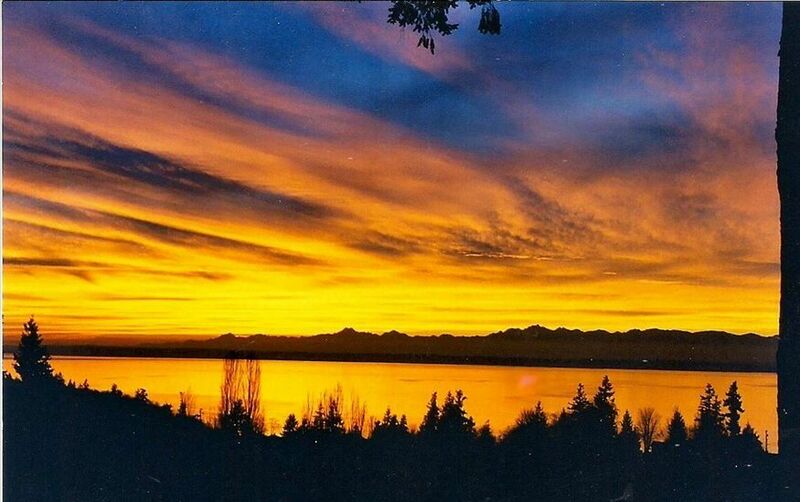 Our home is centrally located with easy access to freeways, so you can be home enjoying the view and sunset while other folks are sitting in traffic trying to get to Marysville or down into Edmonds. This home is located in the Chennault Beach area of Harbor Point which boasts a 5 star arbour Point public golf course and dining facility only 1 minute from house. There are sidewalks, curbs and street lights along the streets. It is a beautiful neighborhood for early morning or evening walks. We take pride in our home and in keeping it up to date, very clean so that you will enjoy your stay and remember to come back someday. This is one of the most beautiful spots in Mukilteo. We just returned from a 10-day stay with our two sons, their wives, and our grandchildren, including a 19-month-old baby. The home was everything and more that was described in the website. The view is incredible, there was plenty of room so that we all were able to have some privacy, and the hot tub was perfect for relaxing after a day of exploring. The kitchen was fully stocked with dishes, glassware, cutlery, pots, pans, even a rice cooker! We all felt incredibly comfortable right away and the home was very accommodating to all of us. It was a wonderful vacation and we would definitely stay there again. Thank you, Tina, for all your help and for providing an amazing home! Our group stayed a week and had the entire house. The views are unbelievable, and the house is set up to enjoy the views from many different vantage points. The area is quiet, peaceful and beautiful. HINT: don't trust your GPS to find the house! The kitchen was indeed a delight, fully equipped for a cook of every level. The pantry and fridge continued a wide variety of staples and other necessities, some from prior guests. The best rooms were the master, with Jacuzzi tub and private balcony looking over the Puget Sound, and the first floor queen with fireplace (which did not work), private patio, and HUGE bathroom with double shower and heated floor. The basement apartment and other second floor bedrooms were ok, but their dedicated bathrooms were not en suite but down and around the hall. Two fabulous restaurants less than a 10 minute drive, and Mukilteo downtown was easily accessed. Cons: only one roll of TP per bathroom (for a week's rental?!!! we had to buy more); being instructed to start the laundry and take the large waste bins some 30 yards down a gravel road....not the happy ending to a otherwise happy stay. Lovely setting and great house! I must confess I was a little nervous up until the day before our arrival here, since I had some difficulty getting in touch with the owner. HOWEVER, once she contacted us, she was right on everything! Tina is conscientious and fair and dealt with a broken hot tub and dishwasher until they were fixed and even gave us a cut on price in the end for the inconvenience. Don't stress if you don't hear from her--she's trustworthy and busy with many properties, and she WILL come through for you! :) She even personally sent my dad's cell phone to him when we figured out he'd left it behind in the house. The house is lovely and HUGE. We ended up renting out the basement in addition to the rest of the house, which gives you additional sleeping spaces, another bathroom and another kitchen! The three bedrooms in the main part of the house are all comfortably decked out with all you need. One has a fireplace; one has a balcony; and all have private bathrooms, (all with big fluffy towels) which was GREAT for our whole family that was gathering for my son's wedding. The kitchen is spectacular and large and very convenient for preparing your own meals. Everything you could need is provided. Everything is top-notch. Of course, the star of the show with this house is the view. Every morning, we'd all gasp at the lovely view of the sound out the windows of the kitchen/living room/dining area. You could do nothing but sit and be perfectly content. The house sits on a private road and is very quiet and peaceful. It's a nice place to get away from the hustle and bustle of the city without being so far removed that you can't get around. We found it to be a good central point for all the wedding activities we were involved in (which took place in Northgate, Mountview Terrace and Arlington) and were very happy we had picked somewhere a little off the beaten path for the downtime we were able to spend with our family during the wedding craziness. Thanks, Tina, for your patience and persistence and for the lovely home you've opened up to people. We hope we can return someday! The house is overall excellent. While nestled in the suburbs of Seattle the lay of the land provides privacy. Awoke each morning to a outstanding view of Pugent Sound, Whidbey Island, and snow covered Olypmic Mountains. The hot tub was nice and the kitchen was generally well stocked for a family of foodies. The owner was attentive when called when the hot tub did not work. The only downside is that it is 17 or so miles from downtown Seattle. That said it is a good launch point for day trips to Olympic National Park, The Cascade Mountains, Bellevue WA, etc. thank you for a beautiful oasis, and a great well furnished hhome, with great views, wonderful spa, and a beautiful home. We were looking for privacy, quiet, seclusion, great views, and we were not dissapointed. Thank you so much, we will stay again. The home sits overlooking Puget Sound, Olympic Mountains and Southern tip of Whidbey Island in Harbour Point Community of Mukilteo. There is a 5 star golf course only 1/2 mile away. Golf: Five Star Golf Course, Harbour Point within walking distance to house. Walter E Hall Golf Course in Everett w/in 20 min drive.